I’m a facilitator and the Head of the Digital Faculty at the GDS Academy. I’ve been part of the team for more than 4 years, helping the UK government achieve its ambition to have one of the most digitally skilled populations of public servants in the world. I have recently returned from spending a week in Ottawa, Canada. Along with Elaine McKenna, another experienced GDS Academy facilitator, we were invited to upskill and collaborate with colleagues from the Canadian government. The GDS Academy is increasingly sharing its expertise with governments in other countries, and our work has come to serve as an inspiration overseas. In December last year, we blogged about our international journey, in particular the visit from a Canadian government delegation where they attended our Hands on Agile for Leaders course, which led directly to this new collaboration. Across the week, we ran courses, spoke to public servants and had some amusing misunderstandings with some British sayings and our accents - what does ‘swinging the lead’ mean? 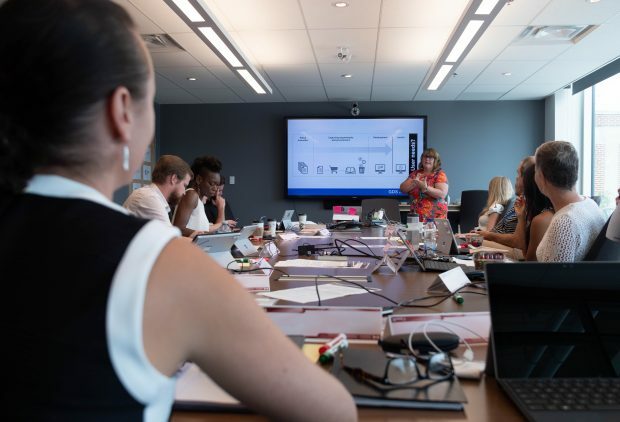 I delivered 3 day-long digital and agile awareness courses to 50 attendees while Elaine delivered 2 one and a half day courses for leaders to 35 Canadian public servants. We adapted our existing GDS Academy course content to meet the user needs we had identified in advance and changed our delivery as we went along, depending on the reactions of the groups. Aneeta Bains, Chief Digital Officer and Assistant Deputy Minister for Innovation, Science and Economic Development in Canada, spoke during both leaders’ courses about the ongoing plans to take digital government forward in their country. David Blair from the Office of the Chief Information Officer, took the opportunity to briefly introduce some of the new tools and frameworks they are developing. This resulted in some lively discussions and feedback that may influence their final products.